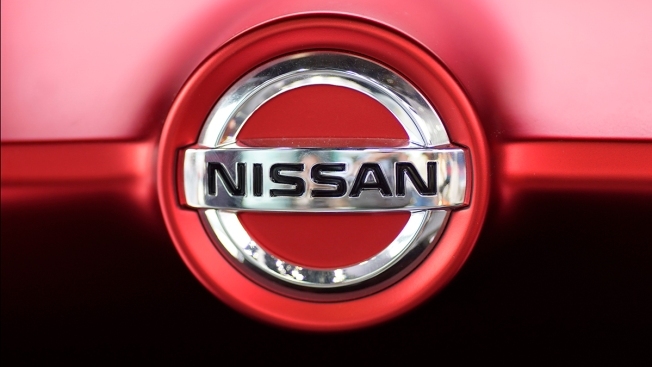 This June 14, 2018, file photo shows a Nissan logo on a car on display at the automaker's showroom in Tokyo. Nissan is recalling more than 215,000 cars and SUVs due to a fire risk, and the company is advising people to park the vehicles outdoors in rare cases. The recall covers certain 2015 to 2017 Nissan Murano, 2016 and 2017 Nissan Maxima, 2017 through 2018 Nissan Pathfinder and 2017 Infiniti QX60 vehicles.